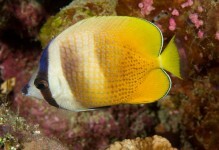 The Spotband Butterflyfish, also known as the Dot Dash Butterflyfish, Punctato Butterflyfish, or Spot-band Butterflyfish, has a yellow-tan body. 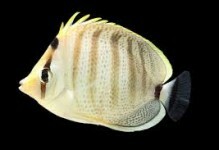 As it matures, it becomes more yellow dorsally with about seven vertical dark stripes on the upper half of the body, with rows of dark spots below. 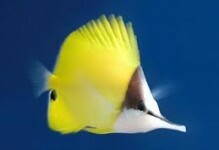 The aquarium for the Spotband Butterflyfish should be 70 gallons or larger, have numerous hiding places, and calm tank mates. 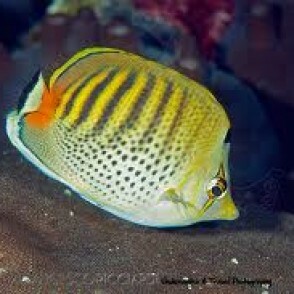 It should not be housed in a reef aquarium since it tends to eat most invertebrates. 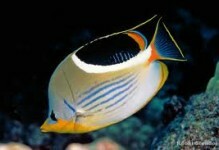 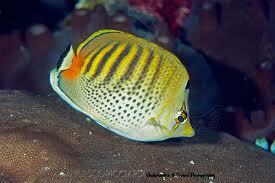 The diet for the Spotband Butterflyfish should consist of finely chopped seafood meats and algae-based meals.